Canada “should be proud” of its status as an energy superpower, says Saskatchewan Premier Brad Wall, and to claim that status the country needs to be able to move those resources across the country to meet the demands of its global customers. In an interview with CTV’s Question Period, Wall said Canada “needs more pipeline capacity,” to move oil and natural gas to ports on either coast. Wall says projects such as TransCanada’s Energy East pipeline and Enbridge’s Northern Gateway pipeline will move oil to ports where it can be shipped overseas, which will also help suppliers get fair market value for their product. “We don’t always act like it, but we should be proud of the fact that we’re an energy power,” Wall told Question Period. Wall said he is encouraged by the energy agreement reached between Alberta Premier Alison Redford and B.C. Premier Christy Clark. And said the Energy East project would also lead to other benefits, particularly in Saskatchewan, such as investment in infrastructure. The proposed Northern Gateway project would see 525,000 barrels of oil from Alberta to a tanker terminal in Kitimat, B.C. The Energy East pipeline would carry 1.1 million barrels of crude from Alberta and Saskatchewan to refineries in Eastern Canada. Meanwhile, officials in Canada are awaiting a decision from U.S. President Barack Obama on the proposed Keystone XL pipeline, which would carry Alberta crude to refineries on the U.S. Gulf Coast. Wall said environmental regulations brought in by Alberta and Saskatchewan should alleviate concerns south of the border. “Between (regulations) and private sector investments and public sector investments like we have here in Saskatchewan, we can go down to our friends in the United States and make the case that when you deal with Canada, when you approve a pipeline from Canada, you’re dealing with a country that is serious about the issue and I would argue more serious than other countries that are sources of oil other than ours,” Wall said. But as for long-awaited environmental regulations from the federal government, Wall said Canada needs to ensure it “strikes the right balance as a country between the environment and the economy. 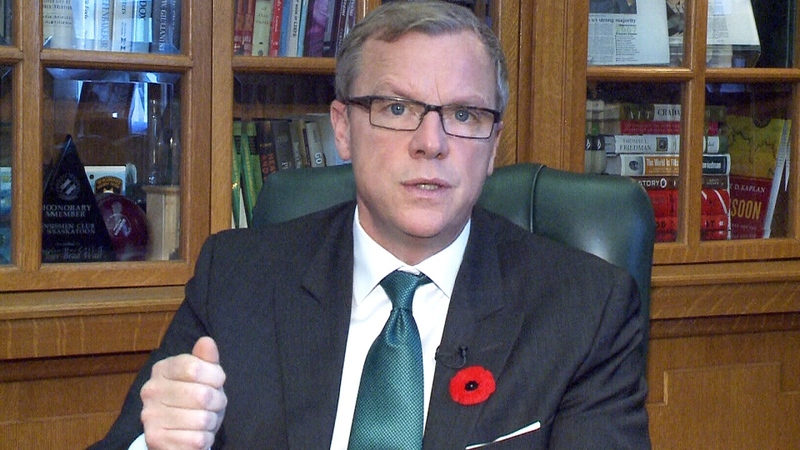 Saskatchewan Premier Brad Wall speaks to CTV's Question Period.